For Russian youth, rave is like lightning: it illuminates and confronts the dark side of Russian society just as much as it burns the strong will and wild freedom of its youth permanently into Russian identity. In a post-Soviet state, dancing has always been a tool for youth to escape Russia’s treacherous past. 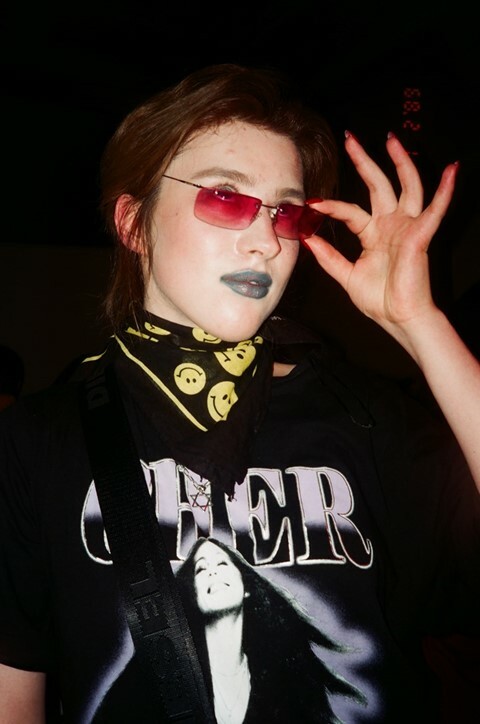 But despite its power as a tool of liberty, in the face of a long line of club closures including Moscow’s monumental ARMA17 in 2014 and Saint Petersburg’s DIY space Rabbitza last year, the future of Russian rave faces uncertain times. So what exactly is the future of Russian youth culture’s most powerful form of resistance? As with all revolutions, the current state of rave in Russia is proving a push and pull relationship with club closures: when authorities enforce, the scene pushes back stronger and smarter than ever. New spaces are constantly being made in reaction, music is becoming more diverse and complex, and new innovations are turning rave into a multi-sensory experience that evades the physicality of clubs. These were themes all highlighted and deliberated at Ballantine’s Whisky's 2018 True Music Series event, which featured a set of panels on the current and future state of clubbing in Russia in collaboration with street artist Felipe Pantone. True Music is committed to spotlighting underground art and uncompromising music talent from across the globe, previously working with Lisbon’s emerging music scene and Africa’s bubbling world of young creatives. Hosted at Moscow’s leading music space, NII, the Russian event united musicians, producers, promoters, and set designers from Moscow’s underground to discuss the intersection of street art and electronic music, and the importance of education in Russia’s electronic music industry. The panels were also set alongside murals of Pantone’s work which fuses music and visual art to transform live music spaces with his Alice in Wonderland, trippy aesthetic. Pantone also created a set of three inspiring artworks which form this year’s True Music Series limited edition gift packaging for Ballantine’s Finest and Ballantine’s 12 Year Old whisky. Tom Elton, Ballantine’s Head of Music, adds: “That’s why we’ve partnered with NII. It’s a unique place in Russia. It’s a music community for people to come together to enjoy themselves, to experience music and art.” After Russia, Elton will mirror the same commitment to hidden creative subcultures by taking True Music to Chile and South Africa. Below, we hear from four figures from Moscow's underground about how they are fighting and thriving amidst club closures. Low 808: The club closures hit the scene hard. It was a challenge for everyone because no one knew how to react under the huge wave of disappointment. Authorities stole the reality of a lot of very talented people. And I personally believe that when someone takes a festival belonging to 15,000 people, then you should definitely challenge and react to it. I was thinking we should react strongly to this, but everyone chose to subtly react. Now, I see that it was a smart move. It’s always more logical to stop and think before reacting, that way you can create a strategy that can work. People are still doing things undercover. And this strategy isn’t simple or aggressive, it’s something that you have to plan. It’s more of an eastern style reaction. We’re not fighting for drugs or for alcohol or for madness, we’re fighting for art and culture – something that makes a difference for future generations. Low 808: I used to run a program on the radio. After everything was cancelled and shut down, I played one hour of music that reflected what I was feeling when the clubs closed down. That stuff influenced some guys, so now Russian electronic music has become a lot more complicated. You’re not going to a club anymore, you’re going to a visual, performance space. It’s a multi-sensory experience. We are attending spaces not just for the alcohol, but in order to experience something real. In that way, it’s now more diverse. You’re seeing it with your eyes and hearing it in your ears. I remember a series of events when I first started attending ARMA17. The location was a factory with a huge ballroom which oozed with the spirit of the underground. They managed to combine regular techno with experimental. It was educational and it opened your mind to new music. The feeling of freedom was different in 90s and in the early 2000s than now. It’s different because it’s much smarter now. If you want to make a difference, you’ve got to be smart. You have to create good music and multi-sensory experience: with taste, smell, sight, sound. It’s hard to still surprise but people here still do – and it’s amazing. My personal feeling is that we are all moving into a direction of mutual creation. I believe that we will, in three to five years, have a 3D visual concert where you’re going to be in different worlds. The closures are not restricting – they give you more power to change and to make a difference. They have empowered us to find new ways of communicating. A lot of programers and graphic designers are building their new world now. Thanks to this technical progression, we are in a position where no one can stop us. Anastacia Tolchneva: It's very weird and scary to think about the future of rave in Russia right now. On the one hand, we are going through different cultural shake-ups and it's really hard to guess what will happen next. However, if we speak music-wise, I am observing a lot of constructive thinking, especially with regard to club music. There are new sounds that have been employed and I am observing many new experiments in rave – for example, the rethinking of dance events and how they can be organised. Club closures in Russia are stressful because the artist needs to think about those practical aspects of where to present her music. However, at this point, I would say that it is not so bad because there are still many locations where you can present your music and develop. I'm positive and sure that there will even be more locations in the future. Limitations on self-expression always lead to a surge of new ways of self-expression. From this point of view maybe in the future we will see that there will be more need for self-expression. There is a saying in Russian, which basically means that when something decreases somewhere else it increases, so when considering the many clubs that have been closed, I feel like it will lead to some other positive trends – there will be some kind of compensation for that. There are many questions and I'm sure that soon there will be answers. I am positive that there will be very interesting developments in the future. Dimitri Semenuk: After the cancellation of ARMA17, the culture has started to boom – it was like an atomic bomb. The most important thing is how thriving in the regions outside Moscow in St Petersburg. For example, I organise festivals like Gamma and Signal where a lot of volunteers are promoters from other cities who are coming to study how we're working. There's a guy from a small town called Yuryev who is a sound engineer for local television, but on the side had been organising raves for 10 years. He made a rave in a car wash – 150 people attended the first one – but after he went to Signal, I connected them with some rave organisers from Moscow, and they went there and it was 500 people. It’s an amazing thing to witness this culture booming so far across the country. The rougher the government is pushing the scene, the more the culture is arising. I believe it’s like a natural process of revolution. The sound of rave in Russia has become quite aggressive in the face of the closures. But at the same time the sound is coming in circles. Right now, acid is very popular: acid house, electro, original electro. Right now this music is like a rebirth for the rave scene. I feel the younger generation is feeling this music so well. Beyond club nights, rave is one of the most important aspects of the fashion industry. There was a very interesting event last year, it was made by Yves Saint Laurent, and the music was techno – this was amazing to witness. Rave and fashion in Russia have always had a strong link – look at Gosha Rubchinskiy who started from NII. His first collection was inspired by the guys who were raving right here and he was founded in this space. I really hope we will become an industry because the harshest battle we face is trying to build our ideas with little money. That’s why brands are super important to us right now. Also artists like Nina Kraviz, for example, will be key to the future. I remember Nina, like, 10 years ago, when she started in Propaganda. Nobody even knew when she got so big and the most important thing she’s doing right now is inviting her friends like Bjarki and Nikita Zabelin onto her label Trip, where they are also starting to become international stars. Freak Fabrique: ARMA17 was its own phenomenon. We were residents there since it was founded more than seven years ago. When it closed down, it was a personal tragedy for us because it has always been part of our lives. When it ended, events started taking place in Moscow that were more localised. It was replaced by a club named Rodnya, which has a different sound which we think is a positive thing. It’s more up-to-date as it corresponds to the clubbers age of 18-25 and is more similar to Berlin’s sound. After ARMA17 shut down, it continued to organise huge festivals like Outline festival and a lot of people attended that, too. But in the last seven years, that has also shut down, which was a huge tragedy for us as well. For us personally, our art hasn’t changed because we still work with other big festivals and are always finding ways to create. We are fundamentalists so our art is always based on fundamental ideas. We get inspired by cinematography, by cartoons, etc, so, we still create and we still create in the same frames of inspiration. If you look at new trends in what we do, of course, it changes – it’s more digital, more visionary. Despite the current trend of clubs shutting down, we still remain positive about the future. People are not giving up. People are still creating in new communities. There’s still development going on. We have a lot to give too. Moscow is developing at a faster rate compared to the rest of Russia. We hope that will change and that there will be no boundaries between Moscow and the rest of the country. We also definitely believe that what ARMA17 represented can be revived – a whole community of artists, musicians, and creators will come back. They will all come together in one big movement soon.